GMO FOODS, ARE THEY GOOD OR BAD? GMO foods are genetically modified so that have had new genes added to their existing genes. Most of the foods available in the market today are genetically modified and there is a lot of controversy around it. GMO foods can present significant allergy risks to people. Genetic modification often mixes or adds proteins from a food that you may be allergic to a food that you aren’t allergic to, prompting an allergic reaction. 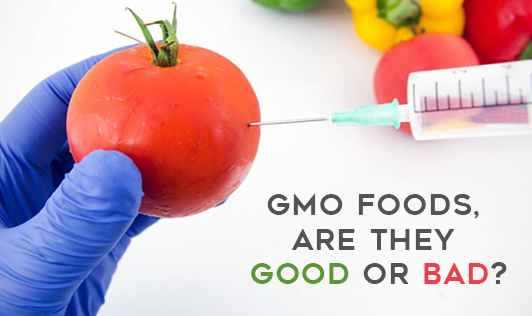 Some GMO foods have had antibiotic features built into them to make them immune or resistant to diseases or viruses. When you eat them, these persist in your body and can make actual antibiotic medications less effective. A constant risk of GMO foods is that the modified genes of the food may escape into the wild. The herbicide-resistant genes from commercial crops may cross into the wild weed population, thus creating "super weeds" that are impossible to kill with herbicides. A related risk is that the escape of genetically enhanced animals and vegetation can create new super-organisms that can out-compete natural animal and plant populations to drive certain species into extinction. Some GMO foods are modified to make them resistant to insects and pests. This can reduce the number of pesticide chemicals used on the plants, thus potentially reducing exposure to pesticides. The increase of GMO crops requires fewer chemicals, time and tools. This, in turn, may help to reduce, greenhouse gas emissions, soil erosion, and pollution and contribute to the sustaining of better air and water quality, indirectly benefiting your personal well-being. GMO foods are modified to be more nutritious in terms of mineral and vitamin content. This plays a significant role in battling malnutrition in the developing world. For example, vitamin A-enhanced rice is helping to reduce global vitamin A deficiencies. GMO crops are safe to eat however there is always uncertainty about safety since there is no conclusive evidence has to how the change in genes may affect us. Remember to always consume fresh and natural food products.